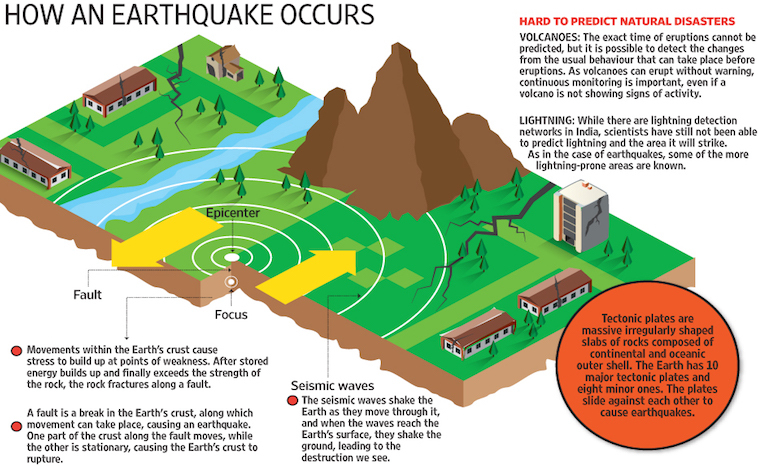 What causes Earthquakes? Do Earthquakes occur more frequently due to how fast the Earth rotates? Read on to learn more about Earthquakes and Earth’s rotation. The theory of plate tectonics appeared in the 1950s. It advanced an earlier theory called continental drift. The theory behind continental drift helped with understanding why unique regions appeared along similar coastlines. Scientists discovered similar fossils along coastlines from different continents. Thousands of years ago, they believe one large continent existed. The large continent, Pangea, broke apart and drifted into the continents we now know today. 3 When Will We Slow Down Again? According to Roger Bilham, a geophysicist at the University of Colorado Boulder, states that the slowing of Earth rotation creates earthquakes. As the earth slows down the equator shrinks. However, the plate tectonics does not shrink as easily and the edges of the plates get squeezed. “Although this amount of squeezing isn’t huge, it does put added stress on plate boundaries that are already under stress, where earthquakes are more likely,” Bilham said. Going back and looking at the data, Bilham reached some interesting conclusions. On average, there were about 15 major earthquakes per year since 1900. What they found proved quite interesting. During certain times, the planet experiences between 25 and 35 earthquakes greater than magnitude 7 in a year. However, when Bilham looked more closely, he found those periods coincided with times when the Earth spins more slowly. Actually, the days got slightly longer. What causes changes in Earth’s rotational speed? Weather patterns like El Niño, ocean currents, and motion in the molten core of the planet. “When fluids speed up, the solid Earth must slow down,” Bilham said. In fact, NASA tracks the length of the day to the microsecond. These slowdowns in Earth’s spin can be predicted five years in advance. When Will We Slow Down Again? As a matter of fact, the Earth is entering a period of slower rotation. If the data conclusion is correct, we could see more earthquakes in 2018. “Whereas an average year might see about 15 earthquakes of magnitude 7 or greater, the next four years could see closer to 20 earthquakes of that size,” Bilham said. “Knowing that earthquakes will be more plentiful in five or six or seven years is useful because if a city planning department is considering retrofitting buildings to make them earthquake-safe now, or in 10 years’ time, the knowledge that more earthquakes are on their way may make them act now, rather than later,” Bilham said. This effect will likely impact only faults that are already under stress and at high risk of rupture. Worldwide each continent has different risks of Earthquakes. South America-Most active zone along the Pacific border. Asia-Particularly where the Australian plate wraps around the Indonesian archipelago, and again in Japan. Africa-Africa has far fewer earthquake zones than other continents. “We have no information on where these earthquakes will occur, except that they will occur at the world’s plate boundaries,” Bilham said. It will be exciting to see what will happen in 2018. If the data from the last century is accurate we will more than likely see an increase in activity. With this information city planners can work to construct buildings that will sustain earthquake impacts creating a safer environment for everyone.